I’ve mentioned before how much I love using this book for read alouds. So this week I read it to all my kindergarten classes. With Pre-K I’m focusing on introducing them to the library and book care, on easy concepts and silly stories, on things that familiarize them with the library or make them excited about books in general. With kindergarten I want to work on developing an excitement about the library beyond the basics of what I’m doing with Pre-K. So this was a great story to get them thinking of the library as a magical place. 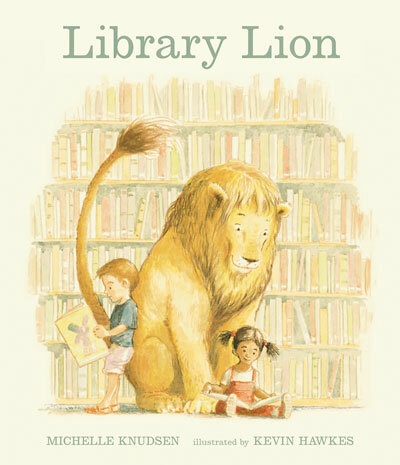 I have tons of stuffed toys and puppets in the library, so I grabbed a lion and told the kids he is “our library lion.” The student in each class who did the best job of getting quiet and ready got to hold the lion through the entire story. They loved this, and I tried to make sure I picked kids who fade into the background a little because they’re so good at being good you almost miss them. Then at the end of the story we passed the lion around so every kid could give him a hug (I hugged him, too). 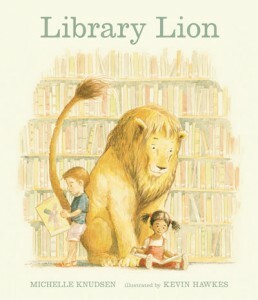 If I had time with the classes, they sat at tables and drew their very own library lion. It worked out really well for the kids, and it was low-key and low stress for me.